The iris plants are looking healthy and are awaiting warm weather to enhance their growth. Although there are no signs of stalks it will not be long before they appear. ​This is the first of many posts for the 2019 season. Enjoy Spring! It is time to begin preparing to take care of our customers iris orders. Customers who ordered irises have their names written on a bag so that we can place their irises in them. 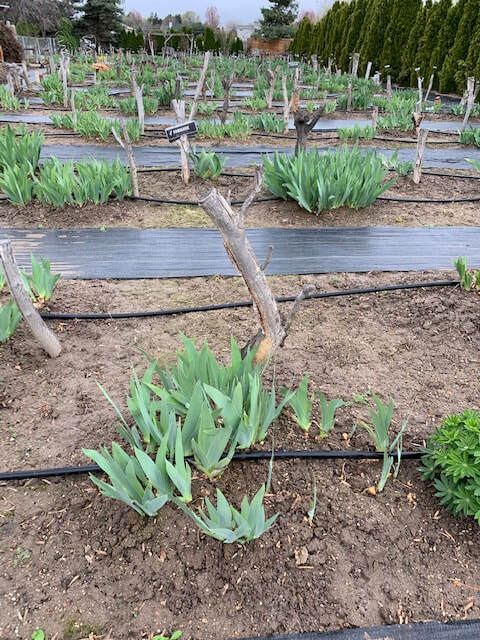 Although we will not begin digging iris till July 23 we have to have our ducks in order to make sure this process runs smoothly, and after all these years of filling orders we've go it down. As you can see by this photo the mid to late blooming iris are still blooming. You can also see I am removing the stalks that no longer have blossoms on them, this serves two purposes. One is to prevent seed pods from opening and secondly to beautify the garden. The viewing garden remains open 7 days a week from 9:00-6:00 so stop by to see these iris in bloom. Iris garden is in full bloom! During blooming season we are open 7 days a week from 9:00-600. We will also be open Memorial day as well as all weekend. Come out to the garden to enjoy their beauty, it is gorgeous! A good way to extend your iris blooming season is to have early bloomers, mid bloomers and late bloomers. The early blooming iris are still blooming and the mid blooming iris are now starting to bloom. The attached photo of Exotic Star is a good example of a mid blooming iris. We are open today from 9:00-6:00 so if you want to bring your mother to the garden to purchase starts of iris to be planted later in July or to just walk the garden to view their beauty come on out. 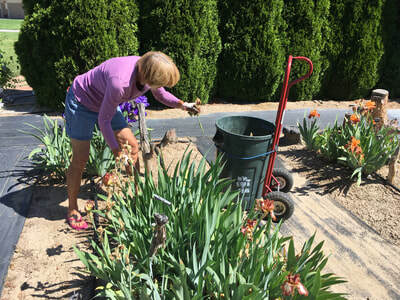 Spend time with mom at JoAnn's iris garden, that is sure to make her happy! This is the craziest blooming season. Here it is May 7th and we only have six iris blooming. I guess mother nature is playing with us. If you want early blooming iris in your flower beds, like this iris named Blatant, now is the time to visit the garden. The iris named "Blatant" is now blooming with many more to follow. We have so many stalks that are developing and with this warm weather on its way it should not be long before they to are showing off their beauty.